Hemovac is a drain used to collect the fluids of the body which accumulate in body after surgical operation. 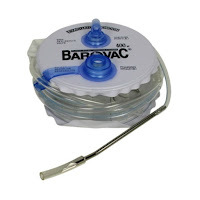 It is a circular shaped container connected to a tube which connects the inner body to the hemovac drain. The one end of tube is inserted into the body during surgery and the other end is connected to the hemovac drain, the incision or cut which is made on the surface in order to insert the tube is known as drain site. Hemovac drain is used to drain not only the excessive fluids of body but also the blood accumulated in body. Hemovac drain is a circular shaped container consist of a cap and stopper above it. A tube is connected to it which has two ends, one end is connected to the hemovac drain and the other one is inserted inside the body during surgery and placed at the position where the excessive fluid or blood is present in body. This tube collects all the fluid and blood in the hemovac and when it gets full, the stopper above it is opened and drain all the fluid out and after cleaning, the stopper is again closed and attach to the tube. Hemovac drain is of different sizes according to the demand. There are varying sizes of hemovac drains one example is 10 Fr., 1/8 inch. It is used to drain wound with trocar. The trocar attached to it is of 5 inches. The material used is silicon having a round shape with perforation in the middle. 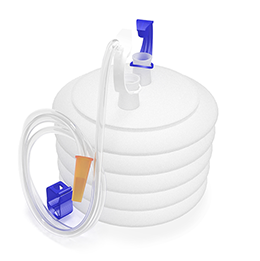 It is a closed system type hemovac drain and can collect fluid or blood up to 400 mL. It is available in the market with the name wound drain with trocar hemovac 400 MI- Hem. It is also known as French hemovac. Hemovac drain should be removed with great care and after practice. The hands should be washed and by holding the one of tube, which is inserted inside the body, with slight firm, the drain should be removed suddenly with a swift and steady motion. After removal the hemovac drain should be placed on a dry and water proof pad or drape. The tube near the skin should be stabilize at its place with the help of gauze of size 4*4 at the drain site. The gauze used should be sterile to avoid infection. A great nursing care is required to keep the dressing clean and sterile. The dressing should be changed after appropriate time and the drain should also be cleaned time to time to avoid any kind of infections. Nursing care is also required to remove the hemovac drain and clean it. Hands should be clean and treated with a hand sanitizer or alcohol based hand cleanser every time. Gloves should be used every time to clean the drain and also to remove it. The skin should be inspected every day to check the infections around the drain site.